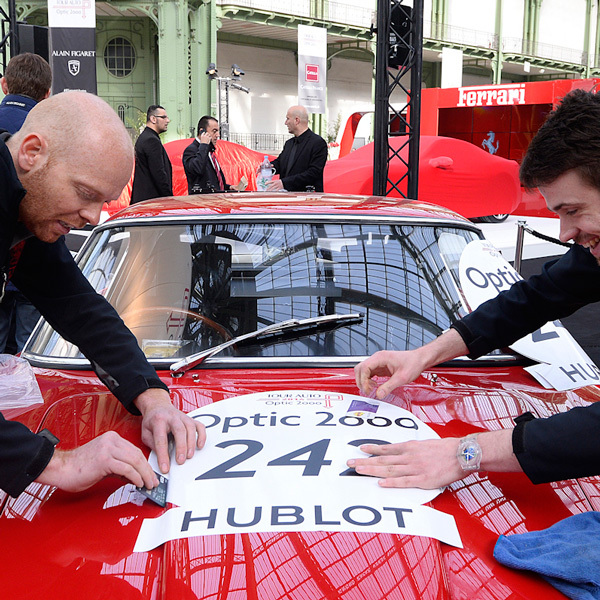 Hublot is delighted to be the exclusive watchmaking partner, for the second year running, of one of Europe's most prestigious classic car events: The Tour Auto Optic 2000. To celebrate the 2014 event, Hublot is unveiling the Tour Auto 2014 Classic Fusion Chrono, a limited edition of just 100 numbered watches. Made from titanium - a lightweight, durable alloy resistant to corrosion - this sporty and elegant watch, which still respects traditional Haute horlogerie codes, is equipped with a HUB1143 self- winding mechanical Chronograph movement with date comprising 280 components including 59 jewels, oscillating at a frequency of 28,600 vibrations/hour and with a 42-hour power reserve. The elegant, satin-finished black sunray dial with vertical red, white and blue stripes to echo the French flag, features two silver sunray satin finish counters, one on the left at 9 o'clock for the minutes and the other on the right at 3 o'clock for the seconds, titanium coloured baton indexes and a date window at 6 o'clock. 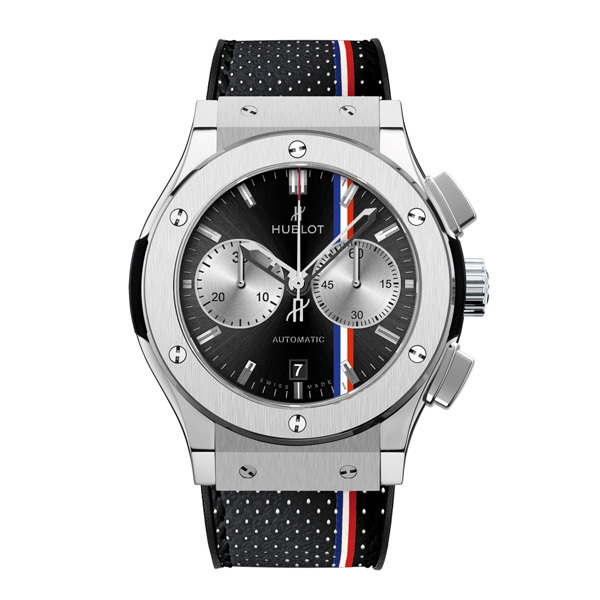 The look is completed with a black perforated calfskin strap sewn onto rubber with black stitching with the stripe motif in the French flag colours of red, white and blue. The watch is water resistant to 50 metres. 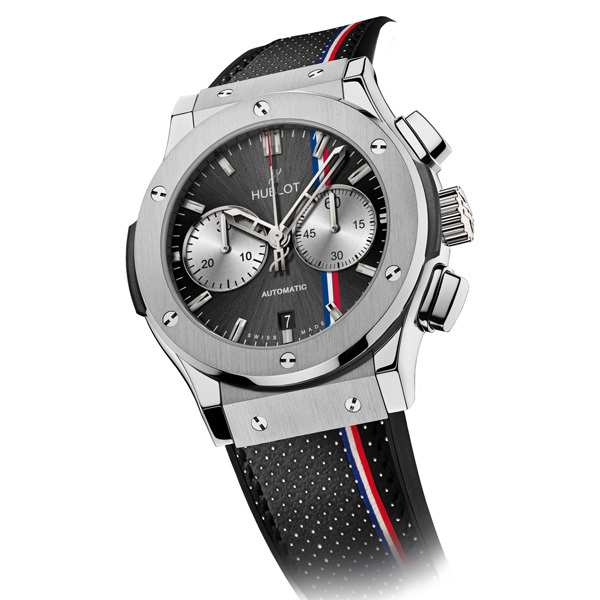 Hublot already has a presence in the world of motor sports, with its exclusive watch partnership with Ferrari, and the Scuderia Ferrari at the Grand Prix. Having partnered the Tour Auto Optic 2000 for the first time in 2013, the 50th anniversary of the legendary Ferrari 250 GTO in 2012 and other events including the Tribute to Ferrari which opened the Mille Miglia rally in Italy, joining Ferrari for a major event in Pebble Beach, California, and closer to the manufacture, where the brand supported the relaunch of the Montreux Grand Prix in Switzerland, the brand is strengthening its presence in the exclusive world of classic cars.